It would be difficult to find a more important process in our weather and climate system than evaporation. Evaporation is the change of water from a liquid to a gas. 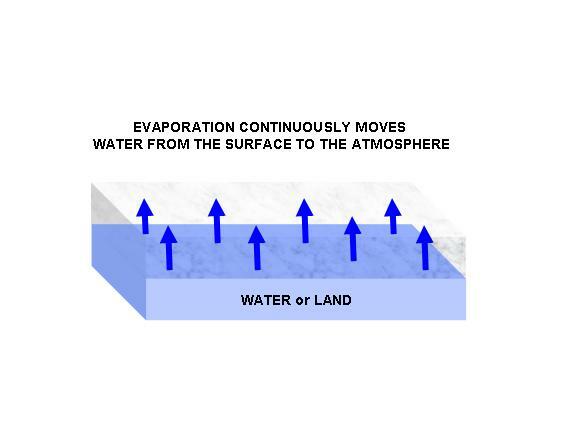 Water is continuously evaporating from the surface of the Earth, literally pumping more and more water vapor into the atmosphere. Averaged across the entire Earth, water evaporates from the surface at a rate of about 3 millimeters per day (about 1/8 of an inch). Over the tropical oceans, the value is much larger; over cold surfaces, it is much lower; and over deserts it is almost zero, since there is little or no water to evaporate. This change of phase (from a liquid to a gas) requires heat, called "latent heat". When water evaporates, it removes heat, lowering the temperature of whatever the water was in contact with. For both water and land surface, most of this heat energy comes from the surface, not from the air. Evaporative cooling, along with convection, helps keeps the surface of the Earth from getting too hot in the presence of solar heating and the Earth's natural greenhouse effect. AVERAGED OVER THE WHOLE EARTH, EVAPORATION EQUALS PRECIPITATION: The only thing that keeps all of this evaporation from filling up the atmosphere with water vapor is precipitation. Rain and snow are continually forming within clouds and falling back to the surface, completing one element of the Earth's hydrologic cycle. The latent heat of condensation, absorbed when the water evaporated, is released to the atmosphere when the water vapor condenses back into cloud water (or cloud ice). This source of heat helps to drive clouds and most other weather systems. For instance, evaporation from the ocean surface is the primary source of energy for hurricanes.